After too long a delay, I am going to finish off this series about good quality, handy, cameras. The delay has been due to a lot of other stuff to do, plus I felt the need to do more lens testing between the four cameras I am describing here. The process has taught me a lot about relative value – which I hope to pass to those that have the same general photography needs. 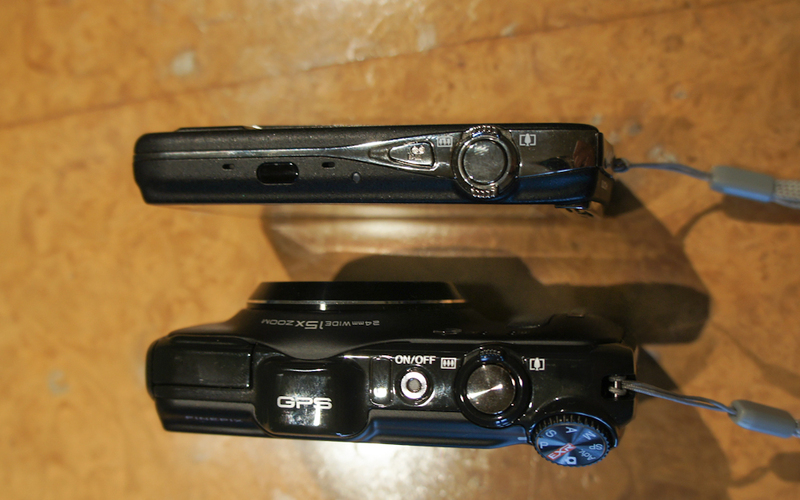 In this section I am going to briefly describe the two Fuji cameras I currently use: the Z900EXR, and the F600EXR (they are shown from the top in the photo above). The EXR technology behind these little gems was described in Part 3, and their size compared to more powerful and expensive systems was covered in Part 1. I was first drawn to this camera by a knockout review in one of my favorite enthusiast sites, Photography Blog , which despite it’s name is a full fledged and respected review website. 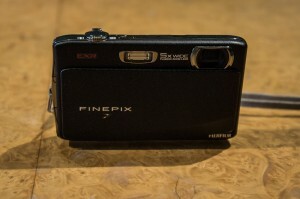 Image quality is their primary rating factor, and of this camera they said: “Image quality on the Fujifilm FinePix Z900EXR digital compact camera is very good in real life situations. What we mean is that for everyday use, you’ll find that the Z900EXR gives cracking shots.” They also said in their conclusion: “It’s a shame that there isn’t a Camera that looks like a budget model but performs like a prosumer award because the Fujifilm Finepix Z900EXR is a strong contender. It looks a lot less than it delivers because of the unassuming exterior “. And that’s more or less what I found when I bought the camera. It takes really excellent shots, which I have printed up to 18″x12” with superb clarity (in fact these ones from the Otter trail). And the EXR features, if used according to the guidance from Kim Lektman work really well, in particular helping resist blown hightlights using the DR capability. Incredibly it’s available in blue on Amazon for £97.66 (why 66 pence? ), while in black it’s £166 (why nearly £70 more expensive when black?). The Canon Powershot S100, in my view it’s closest rival, is currently £381 (not far off the price of an entry-level DSLR! ), so the blue Fuji is a considerable bargain – this is probably a temporary stock thing,so the link and the price may not be valid in a few months time. The lens delivers a 5x zoom, and is completely contained inside the case even at full zoom, so it’s very compact in use also. It’s pretty sharp from the centre to the edge, and reasonably fast at f3.5 max aperture. It only takes photos in JPG, but I have found that editing these in Lightroom provides a surprising amount of headroom for highlights and shadows. Other good points are the extremely strong metal body, tiny overall dimensions, and built-in panorama function (something the Canon does not possess), plus HD video. The camera is completely operated from a huge touch screen, and that has some positives in that all the controls are easily accessed. It can be a bit tedious to change deeper settings, but I found I rapidly got used to it. The batteries are tiny, but seem to last a reasonably long time unless the panorama function is used a lot. OEM spare batteries are cheaply available, so I have 3 batteries in total to enable zillions of shots when away from a power point. On the downside there is no histogram function – which makes tracking blown highlights a bit more difficult – but most people don’t bother with this, and I only occasionally need it. You may have noticed I am more than a little obsessed about camera cases. Why? Because the wrong case in practice not only makes the camera bigger than it needs to be when moving around, but can also render it vulnerable (e.g not waterproof). The Fuji custom cases for both the Z900 and the F600 fail on both these counts. I have now switched to using the excellent Acme Sleek cases. Warning! the shiny ones have the same name as the matt coloured ones, but seem to be quite a bit smaller. 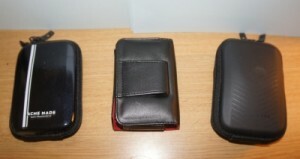 However that makes the smaller case perfect for the F900, and the large case perfect for the F600. The keen observer will however notice that while the Z900 case is a little narrower, it is exactly the same width and height as the F600. Which is why I now take the F600 everywhere I go as my ‘handy camera of choice’. Lets have a deeper look at this great camera. This camera has exactly the same sensor as the Z900, but in a larger body with manual controls (no touch screen), a 15x lens and most importantly RAW capture. RAW collects the entire data set produced by the camera, and lets you extract the most from it, as opposed to JPG, where processing is done in-camera, and many of the decisions made in that process such as dynamic range, noise, and white balance cannot be altered. Thanks to Kim Lektman’s great work, Fuji RAW is supported by Adobe Photoshop and Lightroom, and in these programs, much more can be extracted from the images without a great deal of extra effort (in the case of Lightroom at least). The camera is really nice looking, easy to handle, and only very slightly larger than the Z900. It’s amazingly compact for what it provides, which is full RAW, manual controls, auto panorama, and full HD video. Oh, by the way, it’s also got GPS, which appears to work very nicely, and has got some good reviews. But I should warn you – this camera, or rather it’s predecessor, has some history. The first model of this series, the F550, introduced all theses features, but was shipped with somewhat variable quality control where the lens was pretty soft towards the edge. Several of these models found their way into reviewers hands, and the camera often got heavily panned in the press. But most of the people who bought one loved it, and Kim Lektman plugged away extolling it’s virtues and those of the EXR technology. It’s clear from subsequent reviews that the lens quality problem got fixed in the F600 and later cameras, and that is no longer an issue. But it has made me a bit edgy about the lens quality – so in the next post I am going to cover it in great detail. From knowledgeable reviewers, who know about EXR, the F600EXR gets high marks as in this well written piece from Expert Reviews where the summary is: “Ignore the 16-megapixel mode and treat this as an 8-megapixel camera, and it will take gorgeous photos at breakneck speed”. Exactly (and true for the Z900 also). In almost every respect I love this camera. It’s small, light (280g), fast, and the zoom takes it to places that you could not otherwise get to. In a recent post I showed some photos that I took with it – all using the long zoom, and taken in RAW. The image quality as tested by DxO labs is equivalent to that the best of the current compact cameras (see Part 3). And the camera is very good value: on Amazon at the moment it’s listed at £170 in black, the same price as the Z900 in black (sadly no giant discount for the blue one). That compares well with the two best reviewed zoom travel compacts, the Sony HX9V (20x zoom but no RAW) at £280, and the Canon SX230 (14x zoom, but no RAW or auto pano) at £205. There are a few niggling downsides with the F600 – the mode dial is easy to jog, and while there is a histogram function, it has to be set for each session as opposed to being a standard feature. But for me at least, that’s about it. In summary, if you want a travel zoom, with RAW shooting and auto pano function (both essentials for me), this is the only game in town. It’s not perfect, but it’s a very nice camera, and with care it will produce lovely images. 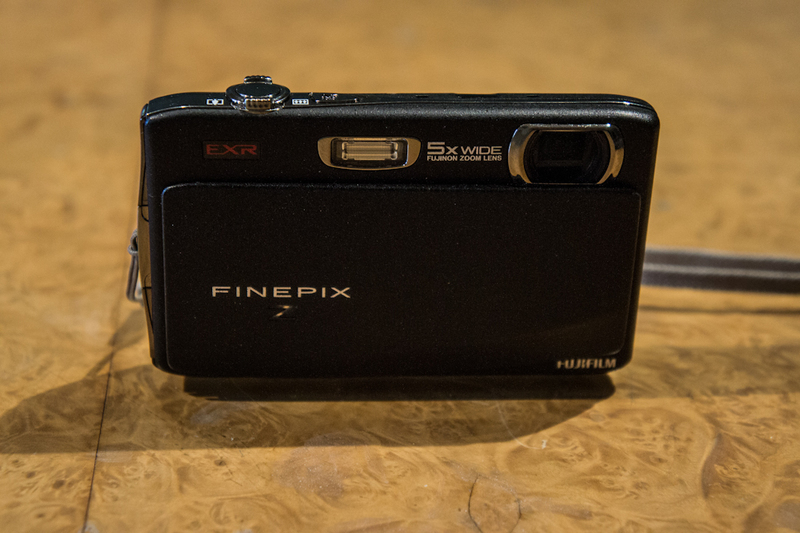 By the way, you may come across its successor, the F770EXR. 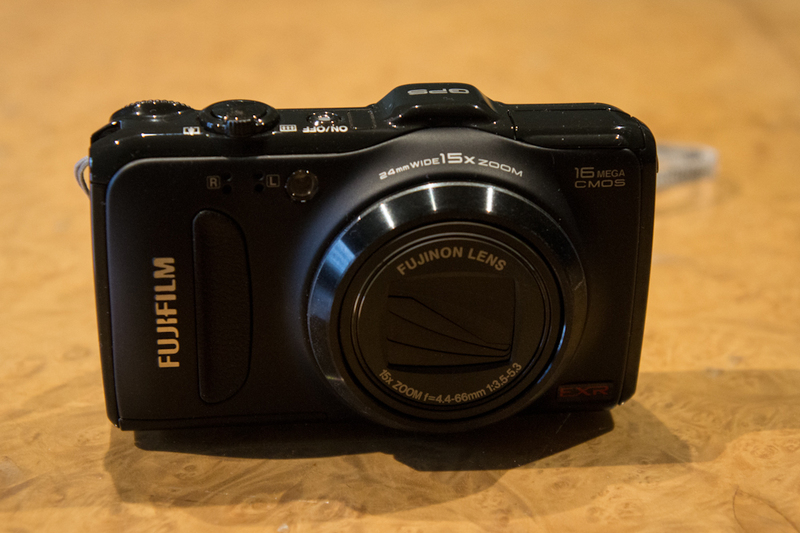 This has a 20x zoom, and a rather attractive new body. However it has got also some indifferent reviews, is a great deal more expensive than the F600, and it is also currently not supported by Adobe, so processing the RAW files is a pain. Having said that the great Kim Lektman has done a huge (16 parts and rising!) set of reviews of it, and he seems to like the camera (and has a hack to convert the files for Lightroom). However, given the F770EXR’s higher price – I would say stick with the F600 if you want a a great camera at a great price. In the next part of this series I will cover how I laid my concerns about lens quality on my F600 to rest. And in the final one, I’ll sum it all up with some thoughts about the perfect, money no object choice for handy and not so handy cameras..